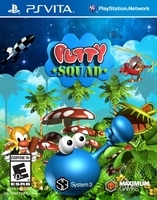 Putty Squad reminds me of the mascot era in video games. When the trend in the video game industry was to come up with your own mascot. Then make your mascot really cool. We had Mario, Sonic, Bubsy, Bonk, Cool Spot, and more. Each game and mascot had their own distinctive feel. The re-imagining of Putty Squad makes me miss that era. I miss many of those mascots. I wish they could make a resurgence. Maybe just maybe Putty Squad can be the spark that ignites that old flame. Players start Putty Squad in a tutorial. Which shows the player all the different moves. I like how Putty Squad provides multiple different control schemes in certain instances. Buttons or the touch screen can be used. You can swap one for the other on the fly. Putty Squad controls like a dream while we play through these amazing looking levels. Yes Putty Squad looks amazing. I can not believe how polished this game looks. With that said there is cartoon violence. We shoot missiles, throw grenades, and use other weapons to take out enemies. The more the player takes out the higher their score. Putty Squad has great music, and multiple different game play modes. You will get your moneys worth out of this purchase at your local or online retailer. There are enough modes and levels to keep most gamers busy for months. As long as you are into the core game play mechanic in Putty Squad. What is it we do in Putty Squad? We explore levels looking for certain characters to absorb. Once we find all of them in a level we need to get to the exit door. There are items to collect, and enemies (if you want to dispose of them). Whether you are jumping, inflating (like a balloon), climbing, or teleporting there is always a way to get through the levels.